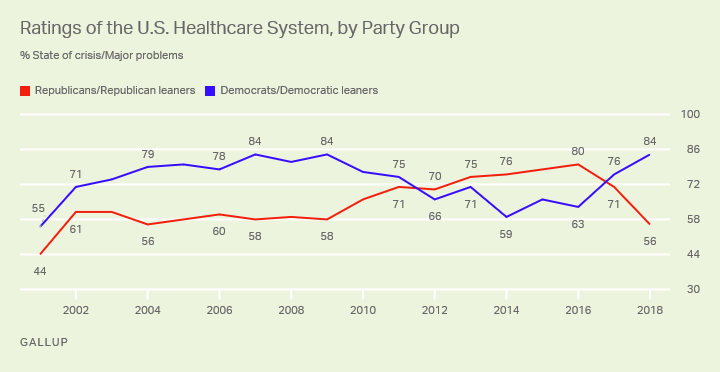 Although the percentage of Americans saying U.S. healthcare has major problems or is in crisis has been fairly flat over the past two decades, Democrats’ and Republicans’ views have changed within that time frame. From 2001 to 2009, Democrats and Democratic-leaning independents were considerably more likely than Republicans and Republican-leaning independents to say healthcare had major problems or was in crisis. Democrats’ negative assessments then decreased in the rest of President Barack Obama’s first term, after passage of the Affordable Care Act (ACA) in 2010, at the same time that Republicans’ concerns mounted. By 2012, the lines crossed, so that during most of Obama’s second term, Republicans were significantly more likely than Democrats to perceive significant or critical problems in the healthcare system. The difference between the two major parties on this measure was just five percentage points in 2017, Trump’s first year, when 76% of Democrats and 71% of Republicans said healthcare had major problems or was in crisis. This expanded to a 28-point gap in 2018, when 84% of Democrats and 56% of Republicans expressed these views — the largest partisan gap on this measure in Gallup’s trend since 2001. The 2018 poll was conducted on the heels of last year’s midterm elections, in which Democratic candidates highlighted key problems with the healthcare system — especially coverage. Consistently since 1994 (except 9/11/2001) about seven-tenths of the nation has believed that the U.S. health care system is in a state of crisis or has major problems. That view persists today. The intensity of this view has varied with the politics. During the administration of George W. Bush, the Democrats thought the system was worse than did the Republicans. Following the passage of the Affordable Care Act under Barack Obama, the Republicans thought the system was worse. At the time of the midterm elections last year, the opinions flipped again when the Democrats had campaigned on the need to fix our system with Medicare for All whereas the Republicans abandoned their attack on Obamacare and called only for guaranteed issue – not excluding people from insurance because of preexisting conditions. Although political polarization is certainly a reality, we should temper our views on this particular difference. It should be noted that the graph is truncated – the bottom 30 percent is not included. It looks like the two sides switched positions two times, but, in fact, except for 2001, at all times the majority of both parties believed that health care was in a state of crisis or had major problems. The point is that a majority of all Americans, regardless of party affiliation, believes that we have very serious problems with our health care system. The main difference is that the Republicans have failed to come up with any effective solutions and thus currently consider the crisis less pressing, whereas the Democrats are now more concerned, in spite of Obamacare, and thus many support a proven solution: Single Payer Medicare for All. It would fix the problems, and everyone, regardless of political affiliation, needs to understand that.